RPS-400-6 Close Range Sensor - Deeter Electronics Ltd. RPS-400-6 Close Range Sensor - Deeter Electronics Ltd. The RPS-400-6 is a compact, high frequency sensor. It was introduced to the Migatron family of ultrasonic sensors to better meet the needs of the machine manufacturing industry. This sensor has a wide array of application solutions not found in other proximity sensor technologies. The RPS-400-6 has an adjustable two to six inch sensing range with background suppression (meaning any object within the desired range is detected, while objects out of the desired range are ignored). It cannot be affected by changes in target color or material. The RPS-400-6 is capable of detecting vibrating and/or tilting targets. A response time of no more than 2.1 ms and an operating frequency of 300 kHz makes the RPS-400-6 a repeatable and accurate high speed sensor. The RPS-400-6 is a three wire NPN transistor output device. The transistor can switch 30VDC at 50 mA continuously. It has a molded VALOX case that is filled with epoxy potting material. The transducer face is made of white silicone. A six-foot cable comes standard with the RPS-400-6. Special cable lengths or connectors are also available for OEM applications. Like all of our ultrasonic sensors, the RPS-400-6 is ideal for detecting clear objects. It’s ability to operate in dusty environments makes it ideal for rugged conveyors, PC board handling equipment, and fillers. Proximity detection is the detection of an object in a given range. 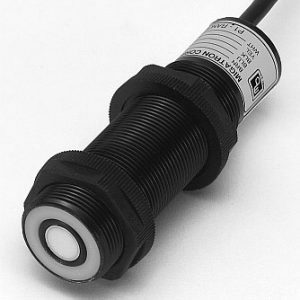 The detection range of the RPS-400-6 is controlled by the "Range Control" potentiometers located on the side of the sensor. Any object within the desired range is detected, while objects out of range are ignored (background suppression). The detect point is independent of size, material, and reflectivity. Operational Range: Adjustable 2" to 6"
RPS-400-6 Housing: VALOX case filled with epoxy potting. Silicon rubber face. Output: NPN Open Collector transistor 30V max / 50mA continuous.